I love to make asian spring rolls. But the sauces and rice papers aren’t paleo friendly. That’s why I invented the unwrapped spring roll salad. 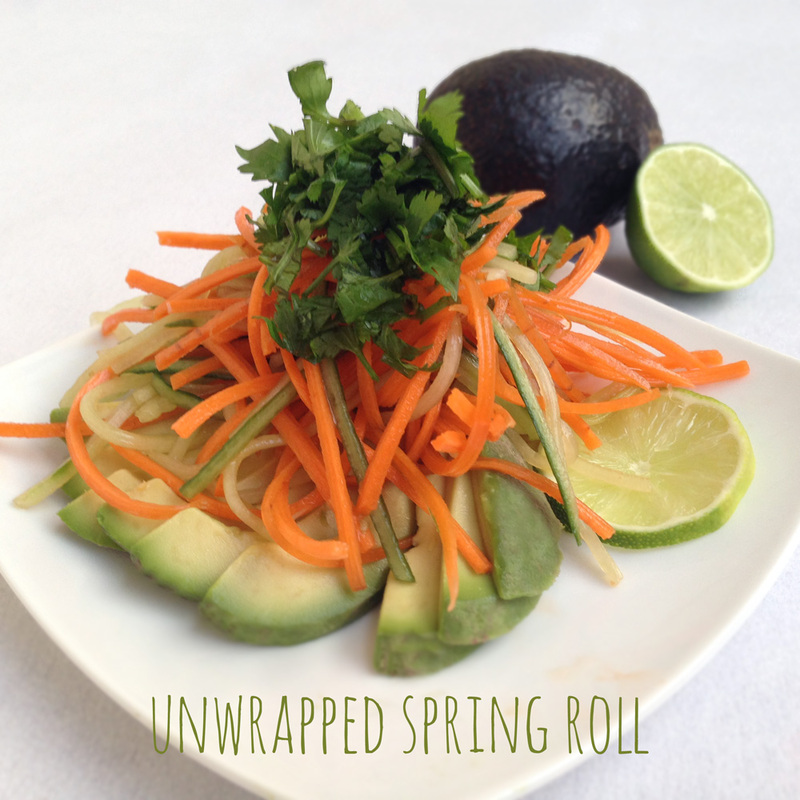 It has all the yumminess of the spring roll without all the rice and preservatives. It’s a light, fresh salad with a homemade sweet chili sauce to dress it. Plus it’s an opportunity to use the julienne peeler that I love so much. Cut off the ends of your carrots and cucumber, then use your julienne peeler to shred it all into sticks (or you can julienne your veggies the hard way). Be sure to stop peeling the cucumber when you reach the seeds. And you’ll miss some of the carrot because the way the peeler works…but that’s okay. Add the carrots to a bowl, then put the cucumber bits on a paper towel to let some of the water drain out of them. In a separate bowl, mix the apple cider vinegar, garlic, honey, fish sauce, and crushed red pepper flakes. This is your dressing. Cut your avocado in half, then slice it and lay it down on a plate. Mix the carrots, cucumber, and dressing in your big bowl (as much dressing as you like, though I wouldn’t use all of it). Once that’s mixed, drop the birds nest of salad on top of your cucumber, then top it with some freshly chopped cilantro. That’s how you make spring rolls in salad form! You can add stir fried shrimp, steak, or chicken to the dish, or just leave it vegetarian. The avocado adds enough protein to make it filling, and the flavors are absolutely delicious. Garnish it with basil, lime, or any other fresh ingredient that mixes well with the asian flavor profile.